Alena Hennessy's inspirational artwork features the quotation "Don't Quit Your Daydream." Bringing artful intrigue to an inspiring message, this vibrant piece by Alena Hennessy celebrates the power of sticking with your dreams. 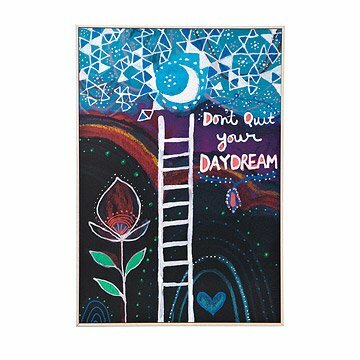 Whether you're gifting for a new graduate or celebrating your own aspirations, this expressive artwork offers encouragement with the empowering quote "Don't Quit Your Daydream" nestled next to a bold blossom and a ladder leading to the stars. Display this compelling piece unframed on high quality Hahnemuhle Torchon acid-free watercolor paper, or an archival print mounted on wood and framed in an ash molding. Made in Portland, Oregon. Very nice piece. Just a little small. Very well packaged. Quick delivery. Creative design. Colorful. Playful. I would rather it were on a canvas, and a little bigger, but for the price I paid, this is a very nice piece, and I suspect my wife will love it. I purchased this art print as a graduation gift for my younger sister. She isn't completely sure of what to do with her degree so I thought this was the perfect way to say "just do whatever makes you happy and don't worry about others' influences." She absolutely loved it! Word of advice: don't buy it framed; you can frame it yourself and it will look much nicer, perhaps cheaper or at worst the same price. Such a stunning work of art! My daughter loved it (for her graduation present). Its so much larger than I thought. The artwork is gorgeous as is the frame.